KODIAK, Alaska -- For less than $1 million, scientists are planning to show off an innovative solar sail experiment beginning with a blastoff from the Alaska frontier Friday, proving new propulsion technologies that could help rid space of unnecessary debris. 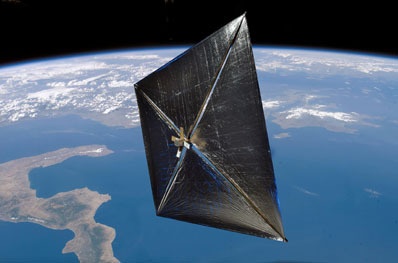 The NanoSail-D mission will unfurl a 100 square foot polymer sail from a satellite the size of a loaf of bread. Researchers say the sail will harness light pressure from the sun to change its orbit, eventually slowing the craft's speed enough to drop from orbit and burn up in Earth's atmosphere. Solar sails don't generate much thrust, but they can propel lightweight spacecraft long distances into the solar system on timescales of months and years. A Japanese solar sail mission, named Ikaros, successfully demonstrated solar sailing on the way from Earth to Venus this summer. Low-cost CubeSat spacecraft like NanoSail-D could prove solar sails can be packed inside canisters like parachutes, providing a disposal system when satellites are finished with their missions. Over time, sails could slow satellite velocities enough to move the craft to graveyard orbits or into the atmosphere for a destructive reentry. NanoSail-D's will stay in space between 70 and 120 days, depending on atmospheric conditions. "Many satellites remain in orbit much longer, and thus NanoSail-D becomes a method for preventing satellites from remaining on orbit much longer and remaining there as space junk," said Dean Alhorn, NanoSail-D's project manager at NASA's Marshall Space Flight Center in Huntsville, Ala. The experiment begins Friday with the launch of a Minotaur 4 rocket from Kodiak Launch Complex in Alaska. For liftoff, the 8.5-pound NanoSail-D spacecraft will be snugly packed inside a larger NASA mothership called FASTSAT. FASTSAT stands for Fast, Affordable Science and Technology Satellite. 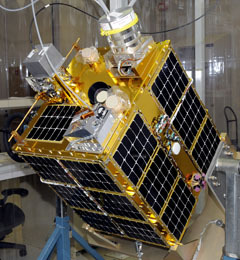 NanoSail-D and the FASTSAT microsatellite are both managed from Marshall. NanoSail-D will be spring-ejected from FASTSAT between seven and nine days after launch, when the satellite is in an acceptable attitude to ensure the two spacecraft do not collide, according to Mark Boudreaux, FASTSAT project manager at Marshall. Officials say the primary objective of NanoSail-D is to release the satellite from FASTSAT, then deploy the ultra-thin sail membrane. "Our goal on the NanoSail-D mission is to be the first nanosatellite ejected from a microsatellite, FASTSAT," Alhorn said. Weighing more than 300 pounds, FASTSAT will continue its mission for more than nine months, hosting five other experiments to probe space weather and test new spacecraft sensors waiting for a ride into space. "Sometimes it can take years to get just the smallest scientific or technology experiment manifested for flight," said Joe Casas, FASTSAT science operations director. "That means delaying the return of scientific knowledge and the technology validation research that could actually advance a number of solutions to the future spaceflight missions, and sometimes even to our real-world problems. FASTSAT is meant to address some of that deficit in our portfolio." Shaped like a rectangular prism, the NanoSail-D spacecraft will be orbiting about 400 miles above Earth, too low to measure significant changes its trajectory on sunlight alone. Atmospheric drag will be the largest force on the satellite at that altitude. The mission timeline calls for unfurling the sail about three days after NanoSail-D ejects from FASTSAT, or between 10 and 12 days after liftoff, according to Casas. Four spring-loaded guide booms will pop out of the compact spacecraft, then the polymer membrane will stretch tight in a diamond shape within about five seconds. "The sail will deploy in only about five seconds, similar to how you push a button and a jack-in-the-box opens," Alhorn told reporters last week. The sail is made of a material called CP1, which launches wrapped on a spindle inside the NanoSail-D spacecraft. The CP1 polymer is about 3 microns thick, tens of times thinner than a human hair, according to Alhorn, who described it as similar to plastic food wrap with aluminum coating on one side. The satellite's low mass and large sail area mean it will most likely naturally decay from orbit within 17 weeks. The short duration will limit viewing opportunities, but Alhorn said amateur astronomers and backyard satellite observers have a chance to catch a glimpse of NanoSail-D passing overhead. Officials are launching an imaging contest to capture pictures of NanoSail-D. Its solar sail is six times larger than an antenna on Iridium satellites, a mobile communications constellation famous for brief bursts in brightness easily visible from the ground. 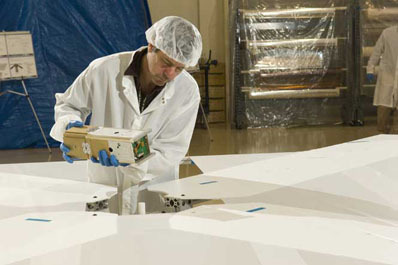 Alhorn expects the spacecraft end up in a spin, and the sail membrane could reflect sunlight to the ground at times, making it visible to observers. On a budget of $500,000, Alhorn's team built two NanoSail spacecraft in four months in early 2008. The first unit was launched on a SpaceX Falcon 1 booster in 2008, but a rocket failure caused the satellite to not reach orbit. Technicians spent the last two years tweaking the backup spacecraft and waiting for a launch opportunity.